Learn from an expert while you become the expert. 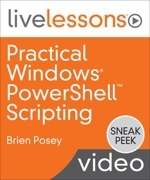 Practical Windows PowerShell Scripting LiveLessons begins with the basics of working with PowerShell and progresses to areas that are not typically covered, such as building GUI interfaces. The entire video is designed to be hands on, and is created by an instructor who is highly experienced with creating complex PowerShell scripts. The goal of this video series is to teach skills for building PowerShell scripts that serve a practical purpose. These scripts can be used in day-to-day tasks for most jobs. The videos assume no prior PowerShell knowledge. The information is presented in such a way that each lesson builds onto the previous lesson, working toward the eventual coverage of advanced PowerShell concepts. This course is ideal for anyone who wants to learn PowerShell. It is also well suited to those who already know PowerShell, but who want to be able to create PowerShell scripts that function more like applications. Lesson 1 is an introduction to Windows PowerShell. In this lesson, you will learn what PowerShell is, and how to use the PowerShell interface. This lesson also discusses the basics of PowerShell syntax, and how you can get help with commands. You will also learn how to tell exactly what a command is going to do, before you actually execute the command. Lesson 2 takes a more in-depth look at PowerShell cmdlets. You will learn about commonly used cmdlets, and how to work with basic PowerShell elements including objects and attributes, variables, and modules. This lesson also discusses techniques for diagnosing and resolving PowerShell errors. Lesson 3 is an introduction to PowerShell scripting, including how to build PowerShell scripts. Learn how to configure the PowerShell execution policies, and how to add functions to scripts. You will also learn how to authenticate a script both interactively and automatically, and how to suppress script errors. Lesson 4 builds on the previous lesson by discussing how to enhance your PowerShell scripts. Learn how to pass variables to functions, as well as the difference between global and local variables. This lesson also discusses how to create loops, how to leverage .NET integration from a PowerShell script, and how to create stand-alone functions. Lesson 5 discusses how PowerShell can be used to interact with the Active Directory. Here you will learn how to query the Active Directory, and how to create and modify Active Directory user accounts from PowerShell. You will even learn how to use PowerShell to create and manage Active Directory groups. Lesson 6 covers how to automate PowerShell scripts. In this lesson, learn how to make a PowerShell script run at a scheduled time, and how to generate e-mail-based notifications from within a script. This lesson also discusses some best practices for PowerShell scripting. Lesson 7 explains how to use PowerShell as a reporting engine. Learn some basic techniques for displaying data and how to write a report to CSV, TXT, and HTML files. You will also learn how to add color and formatting to the PowerShell reports that you create. Lesson 8 builds on the previous lesson by exploring graphical reporting options in PowerShell. Although PowerShell has a reputation for being a text-only environment, it can be used to create very rich graphical charts. In this lesson, you will learn how to create simple charts, change chart types, and import data into PowerShell charts. Lesson 9 teaches you how to use PowerShell to interact with remote systems. You will learn to establish remote sessions, run cmdlets on remote systems, and even compile data from a collection of remote servers. Lesson 10 wraps up the video series by explaining how to build your own GUI. Although PowerShell is widely regarded as being a text-only environment, it is possible to create PowerShell scripts that include a GUI interface. This lesson teaches you how to create basic GUIs, and how to add GUI elements such as text boxes, buttons, and drop-down lists. Posey, Brien. Practical Windows PowerShell Scripting LiveLessons. Indianapolis: Sams 2016. Video.